Beer and cheese...what's a better combination than that?! This stuff is soooo good, and so easy to make: perfect for whipping up for impromptu guests, pot lucks, tailgate parties, sports gatherings, you name it. And yet another reason love my food processor: just put everything in and you're done! Add shredded cheddar, cream cheese, worcestershire sauce (the veg kind), garlic powder, paprika, and dry mustard, and whirl together until it's mostly combined. Mine actually formed a sort of ball, so that's when I knew it was time to add the beer. The recipe calls for a Pilsner, but I think a nice Hefeweizen or lager could work too. 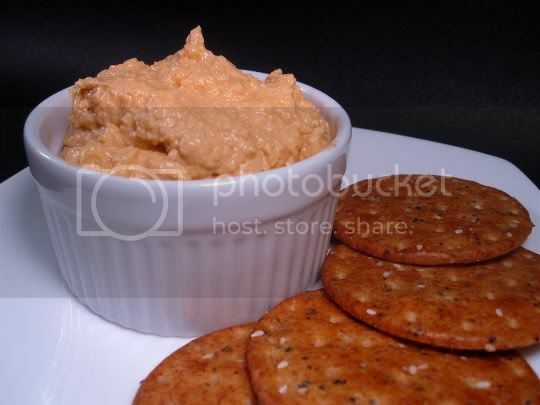 The end result will be a smooth, aromatic, savory and delicious spread that is great on crackers, bread, even for veggies. The strong cheddar flavor really stands up to the beer, and the beer gives the spread a nice yeasty, hoppy aroma and yummy bitterness. The worcestershire adds a fruity tanginess and slight sweetness. Trust me, this stuff is absolutely addictive. Make again? Definitely! This is one of those recipes you'll want to show off to your friends. And serve with beer, of course! Vegan variation: Use vegan cheddar shreds and vegan cream cheese.